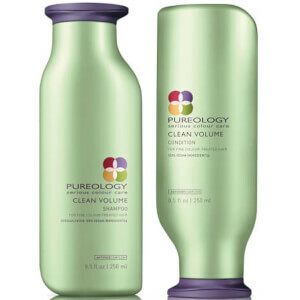 Protect and volumise your fine, colour-treated hair with Pureology Clean Volume Shampoo, a ZEROSULFATE®, body-building formula that adds weightless volume to limp, lifeless locks. Gently cleansing away dirt and impurities, the volumising shampoo eliminates grime and build-up while promoting airy, full-bodied appearance. 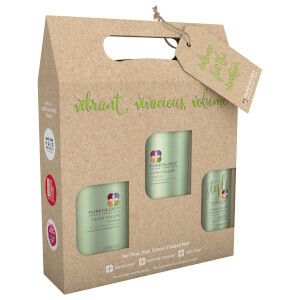 The shampoo utilises Aloe Water, which adds fullness to hair, absorbs oils and retains moisture, while Soy Protein and an ANTIFADE COMPLEX® fortifies, adds lustre and protects to leave your coloured hair vibrant and vivid for longer. Hair looks healthy, shiny and voluptuous. Suitable for fine, color-treated hair. Apply a small amount to wet hair, lather and rinse. Repeat if necessary. For optimal results, use with Clean Volume Conditioner. Aqua/Water/Eau, Decyl Glucoside, Cocamidopropyl Betaine, Sodium Cocoyl Isethionate, Cocamide Mipa, Sodium Chloride, PEG-55 Propylene Glycol Oleate, Propylene Glycol, Glycerin, Parfum/Fragrance, Sodium Benzoate, Brassicamidopropyl Dimethylamine, Hydrogenated Coconut Acid, Salicylic Acid, Sodium Isethionate, Tocopheryl Acetate, Hydrolyzed Soy Protein, Aloe Barbadensis Leaf Juice, Butylene Glycol, Benzyl Alcohol, Benzyl Salicylate, Linalool, Helianthus Annuus Seed Extract/Sunflower Seed Extract, Coumarin, Ethylhexyl Methoxycinnamate, Citronellol, Citric Acid, Potassium Sorbate, BHT, Sodium Hydroxide. I have a lot of fine hair and whilst the shampoo + conditioner add volume there is no shine or vibrancy to my coloured hair. Shampoo is also way too runny so end up using too much (runs out of your hands in the shower). Okay for a night out if you want extra volume but not good for daily use. Will not purchase again. Best shampoo I've ever used. I've fine, greasy but loads of hair. Yes it does leave your hair difficult to brush as others have mentioned, but only if you don't use conditioner or other products but who with long hair actually does that?! I've used every highend brand under the sun and needed a shampoo that prolonged my wash due to spinal surgery. 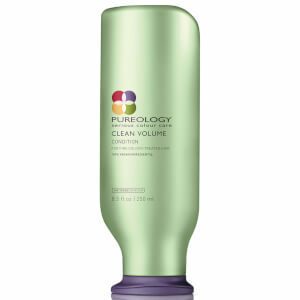 I can get two extra days with this, hair is squeaky clean, volumous and healthy. I used the purology frizz ans hydrate range and would end up covered in grease after 8 hours due to the silicone content. The clean shampoo from this range isn't as good as this one. I use it with redkin or kerastase conditioner. Couldn't be without it if you've greasy hair. 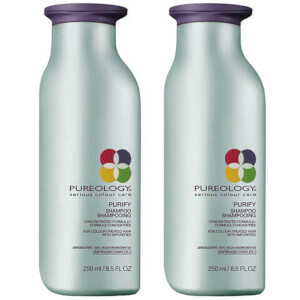 I usually use pureology hydrate but decided to try this for a change. The shampoo made my hair feel horrible and impossible to comb. It felt dry and lacked the usual shine i get from hydrate shampoo. I have fine straight hair past my shoulders. It is fine but i have a lot of hair. If this describes your hair dont waste your money on this shampoo. Great product - I have long thick hair which gets greasy after a day or two after washing and this has changed things, I can get up to 4-5 days without washing and my scalp never felt as clean. I actually feel so fresh after it. Highly recommend and the smell is divine! Love this range. I was a kerastase girl but now I have changed and this is cheaper! Winner all round.